But you can’t. Because professionalism. The standard report card comments are fine for the most part, but sometimes they don’t quite capture everything. Here are some other report card comments that I wish existed. 1. Homework quality suspiciously good. Yeah, your second grader didn’t make that diorama of the Paleolithic Period. I’m onto you, Mom! 2. Excellent teacher gifts! Keep up the good work! You can never have enough of those parents. 3. Please stop asking for extra credit. 4. Why is your life not a telenovela? Because the excuses your child makes for not doing her homework are truly dramatic. 5. Ego management could be improved. I guess for this year I’ll stick with “capable of better work” and “has a desire to learn,” but a teacher can dream! 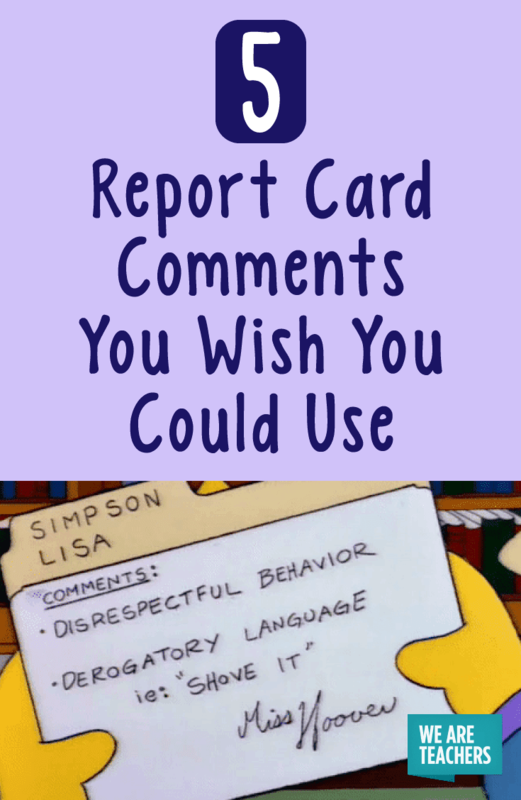 What report card comments do you wish you could write? Come and share in our WeAreTeachers HELPLINE group on Facebook. Plus, 10 types of teachers you can spot at every faculty meeting.